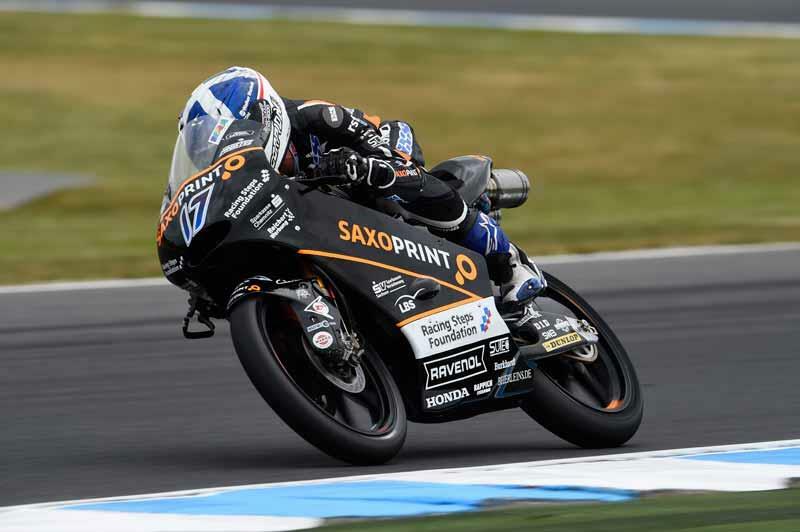 John McPhee will start from the front row for the first time in 2015 with the Scotsman set to line up on pole position for tomorrow's Moto3 race at Phillip Island. McPhee, who has had a difficult year on the Racing Team Germany bike, has looked at ease all weekend and said that from the first session he has been comfortable on the bike and since then his confidence has grown. "It's my first time on the front row this season and the first pole position of my career," said McPhee. "It's not exactly how you want to take it. It would have been nicer to do it on an out and out time but anyway, after an up and down season I'm really happy to be on the front row. We've had a stronger weekend than we've had in the last few races. Things are finally starting to move forward. I'm feeling positive for the race tomorrow." While it's easy to dispute a one off lap in qualifying McPhee has been quick throughout the weekend and on Saturday was consistently to the front of the Moto3 field. "It's nice to turn things around and show people what we are capable of. All weekend we haven't really changed the bike. We arrived here from Japan and it just seemed to work. For that reason it gave us the chance to try some different things set-up wise which have been more positive as the weekend has gone on. I'm really looking forward to the race tomorrow." Moto3: McPhee's future hanging in the balance?